Originally uploaded by Gracie Cakes. 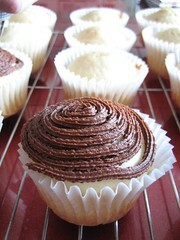 I just finished two vanilla on vanilla cup cakes from Magnolia. God help me. Try Bakesale Betty's in Oakland/Berkeley, CA! where do you post your recipes and how-tos- for the swirlys?